Big beautiful old buildings? - Check. Gorgeous laneways full of boutique shops? - Check. Small restaurants serving up mouthwatering food? - Check. Some great tourist attractions to fill your day? - Check. We didn't really have many expectations as we trained to Cardiff with our laptops out and music on early on Sunday morning, and if we had any, it was that it would actually just be a 'nothing' town - how sad I know - just somewhere to do a little exploring, a little eating, but more of a stop over place on the way to bigger and 'better' cities. How wrong we were. Maybe we enjoyed ourselves so much as we were only there 48 hours so crammed as much in as we could, but I doubt it. It really was such a quaint little town full of crazy speaking welsh, gorgeous restaurants and warm pub serving great cidar, and if you get the chance, should be put on your own travel map. We didn't stay there long, and we didn't do a huge amount, but I think that was the key to such a fantastic experience here - short trip, relaxed atmosphere, doing tourist 'stuff' on our own terms. Here is Morgan & I's synopsis of how Cardiff should be done, in a mere 48 hours.. Ate in two 'must go to' pubs/restaurants - "The Spotted Pig" & "The Yard"
Putting on our running shoes when we first arrived and literally jogging/walking the whole town of Cardiff - it is small, and this is do-able and if you are going to go to Cardiff, something we highly recommend. We had such a fun time doing it on the first day, we actually got up early day 2 to do it again - it was one of the best ways to see the city on a whim. 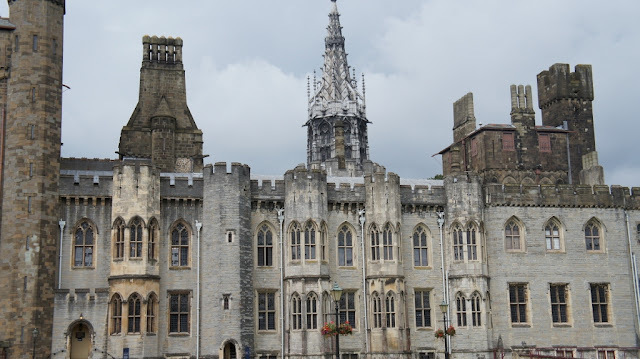 Cardiff Castle - & doing the Premium tour. This saw us get taken through the old living quarters of the owners who used to live there back in the 1800's with all the stories and secrets of the castle. The castle itself (stone, outer walls) is over 2,000 years old and ... you are allowed to touch it! So Morgs & I spent our time running our hands along the rough stone walls marvelling in the fact we were touching something so old with so much history. The Yard - great food, amazing beer (& cidar) and friendly bar staff. We went to go and take an hours bus ride to a National Park but got sucked in to this gorgeous pub with vintage decor instead. We sat on old chester couches in the warmth watching the Olympics drinking delicious beer & cidar. P.s the pubs are fantastic over here, if you aren't sure what you want to drink they let you sample whatever you like (on tap only though). So Morgs & I had our own little beer tasting session - for free! - here as well. Walking through Cardiff markets and buying lots of little bits of food to munch on - we ate a traditional welsh cake here & it was delicious!! (Think a sweet piklet, smothered in sugar). The hostel - surprisingly! It was such a great little place and our very first hostel experience. We had booked a private double room with ensuite but when we got there realised we had a tiny room ...with bunk beds and a shared bathroom. We took it all in our stride though & still really loved it. That, plus the free apple pie & ice cream in the common room that night. Plus Morgs hilarious response when he realised we got bunk beds made it all just a laugh. "Quick babe, avert your eyes or look the other way or something, that could be part of the castle and we can't see it yet!! We need something to do tomorrow" - Morgan (in all seriousness! He said this as we first arrived & realised just how small Cardiff was and were wondering how to fill our 48 hours). "WOOOOOO I bags the top bunk!!" - Morgan. "Nooooo I get itttt" - Anna. "Nope, boys only, sorry hunny". "I went in to go shop lifting twice with the guy, and he wouldn't even go in to help me!" - Random young Welsh boys walking past our window at 2am that woke us up, talking about the shop lifting escapade they'd just been on!! You guys are just great :) Morgan reminds me of my boyfriend, he would definitely want the top bunk as well :D I´m glad to hear (read) you are having so much fun and that you are sharing every moment with us. I´m looking forward to the next post. Hi Anna, I am so glad that you are getting the chance to blog while you're away on vacation, so kind of of you to keep us informed! Loving how you described Cardiff and the cute quotes! Hope you're having the most amazing time!